Can UC Berkeley commit to diversity without affirmative action? When I got into UC Berkeley, people reacted. Most of the reactions were positive — my family members and friends were proud and congratulated my success. There is no pretending, however, that I did not also receive reactions of a different tone. Most often, these reactions insinuated that I had easier access to the No. 1 public university in the world because I am Mexican, low-income and a woman. Tokenism has followed me since birth and continues to bite at my heels. I bring “diversity” to the room upon entering. But if there’s one unwarranted perception of my status as a UC Berkeley student, it’s that my underrepresented status somehow made it easier for me, and others like me, to set foot on this campus. Besides just being a problematic stance that undermines the accomplishments of marginalized populations, it’s also patently false — affirmative action has been banned in California since 1996. Every time the ban has been challenged, it has been upheld. Since the ban, the proportion of enrolled Latino and Black students at UC Berkeley has declined compared to that of of graduating high schoolers. Sometimes the numbers are able to speak for themselves and sway popular opinion. In the case of affirmative action being banned in California, those who opposed it have maintained their opposition. I’m not going to explicate the concept of affirmative action. The Daily Californian has already done that in the past. What I want to do is address the nuances of these policies and how they can realistically be brought back into the conversation at UC Berkeley. A fear for what the future entails drives some of the desperation that activists feel regarding affirmative action. Jose Lagos, a By Any Means Necessary, or BAMN, organizer, is an outspoken advocate for affirmative action and campaign manager for the Defend Affirmative Action Party, or DAAP. His views on the issue are informed by the fact that these currently banned policies are proven to be effective at increasing diversity on college campuses. Also important to consider is the correlation between socioeconomic status and education level. Children from a low socioeconomic background with parents who had to enter the workforce rather than pursue education are likely to follow suit. On top of that, systematic racism has resulted in United States’ Latino and Black populations experiencing disproportionate rates of poverty — 20 percent and 22 percent, respectively, to the 9 percent rate in the white population. Would-be college students get stuck in a flawed system that disallows them the opportunities they would have if they came from a place of privilege. It’s a cycle difficult to break out of without intervention. Further entrenching this cycle is a continued dependence on standardized test scores to for college admissions. The SAT was developed from an intentionally racist perspective to prove white intelligence over that of other races. In more recent decades, the test has more generally advantaged students from higher socioeconomic backgrounds. That bias is in the way the SAT is set up. When it comes time to grade, questions with more right answers count toward the overall score while questions that many test takers struggle with are thrown out. Minority students actually do better on the “harder” questions — the questions that don’t contribute to the final score. Furthermore, the language of the SAT caters more to the knowledge of socioeconomically privileged students than that of their marginalized counterparts. In a 1998 study conducted with the wounds of Proposition 209 still open, it was concluded that the lack of minority students on college campuses can mainly be attributed to their lower standardized test scores in comparison to white students. Twenty years later, most college admissions offices still consider these standardized tests to be an important part of the application. If UC Berkeley were to remove standardized tests from its application, it would be a genuine step toward increasing diversity on campus. When University of Texas applicant Abigail Fisher alleged that she was rejected because she was white, the case was taken to the Supreme Court. As the court battle waged on, UC President Janet Napolitano — along with the chancellors of all 10 UC campuses — filed an amicus curiae brief in a showcase of their support for the University of Texas. The brief was a result of 20 years’ worth of failure in the wake of Prop. 209. It confirmed what many Black and Latino students already knew: Affirmative action is the only measure that gave underrepresented students a fair shot at a college acceptance. These policies ensure that historically underrepresented populations are, well, not so underrepresented. But is there enough student support? Affirmative action has been on the backburner for so long that it’s difficult to tell. Groups such as BAMN are particularly outspoken about the issue. This year’s ASUC candidate platforms revealed what’s really on the minds of UC Berkeley students — issues such as sustainability, housing and basic needs have taken the main stage. Not to mention Prop. 209. If UC Berkeley decides to disregard Prop. 209, there is the very real possibility that it will be sued by the state. 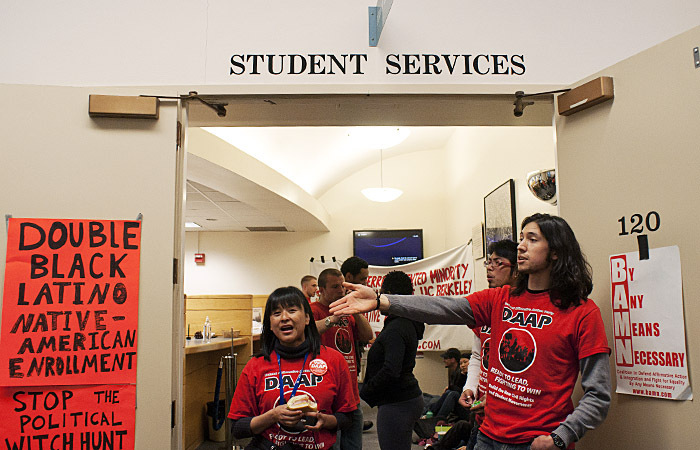 But Stephanie Gutierrez, a UC Berkeley freshman who recently made headlines as the DAAP candidate for ASUC president, believes that setting an example is important and that the university will receive strong student support despite the backlash. “The UC system has a lot of respect. People look to it as an example,” Gutierrez said. Genuine action plan or outdated pipe dream? Regarding why the UC system in particular should look toward affirmative action policies, Gutierrez spoke on its significance and ability to set an example. The question then becomes one of logistics. If affirmative action garners enough support in a student movement, what can be done if the shackles of Prop. 209 are still very much in place? One way to do this could be to step away from advocating for all-or-nothing affirmative action policies and focusing on smaller tasks. While this would leave proponents of sweeping reform unsatisfied to some extent, implementing small-scale affirmative action policies with proven effectiveness is a step toward genuine progress. Some might believe that admitting these students only sets them up for failure. This concern has classist undertones and is unfounded. UC Berkeley in particular has a strong Educational Opportunity Program, or EOP, that does an excellent job at supporting historically underrepresented students and helping them achieve their academic goals. The resources are already in place. What comes next is to admit the students who would make use of them. Undoing the systematic racism still very much embedded in collective American society isn’t as easy as giving more Latino and Black students a fair shot at receiving that blue and gold admissions letter. Obviously, there are other bases to cover. But it’s a start, and it’s a good one. It’s an intervention on the unfair classist cycle that plagues minority students. So — is it time to bring back affirmative action? Ultimately, there’s no denying that concrete changes need to be made to the admissions process. Overturning the ban on affirmative action is a daunting task, but there are smaller steps to take first. But what is stopping UC Berkeley from removing the anachronistic SAT and ACT from its college applications? Other colleges have found this to be a successful tool for diversifying their campuses. Until the playing field for college admissions is decidedly equal, you won’t find groups such as BAMN staying silent — and justifiably so. If raising the number of enrolled underrepresented students at UC Berkeley means I’ll have to endure more snide comments regarding other people’s thoughts on why I’m here, then so be it. At least I’ll know that future generations who look like me will be a little less bleak, a little less oppressed and a little less forced to take to the streets demanding basic human rights. Contact Alex Jiménez at [email protected] and follow her on Twitter at @alexluceli.